An Innovation in The Lost and Damned. 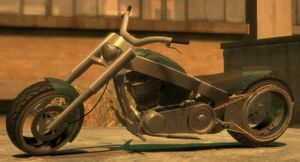 The Liberty City Cycles Innovation is a chopper in the downloadable episodic pack The Lost and Damned for Grand Theft Auto IV. The bike is reintroduced unchanged in the Last Team Standing Update for Grand Theft Auto V.
The Innovation is a radically designed custom chopper with fine detailing and unconventional design elements, most notably featuring a rear wheel which sprocket connected to the chain drive is directly mounted onto the rim and encompasses the diameter of the rim. The vehicle also features an elaborate tribal paintjob which incorporates The Lost's insignia on the gas tank, and further encompasses the wheel covers or mudguards, and even the outer extent of the rear rim. The Innovation is based on a Orange County Choppers Original. The Innovation in GTA V.
Despite its custom appearance, the Innovation's performance is average. While the bike has a good rate of acceleration, it merely has a mediocre top speed of around 125 kpg/77 mph. The bike also has responsive braking and good grip, but steers slightly poorly as it often requires the player release the throttle when cornering. The bike's long chopper profile also contributes to a long wheel base, and a result, is relatively poor at cornering unless the handbrake is utilized. The default radio station in the Innovation is Liberty Rock Radio 97.8. Although the Innovation physically bears no Liberty City Cycles badge, police radio chatter do make reference of its badge name. Being a unique vehicle, the Innovation is not found amongst traffic. After killing the 50 seagulls, the Innovation will spawn next to safehouse(s). This will also add the Innovation to the list of bikes that the player can request from Clay Simons. Innovations can rarely be seen with opponents in the bike races. The player will be disqualified if they takes an opponent's bike. Can be obtained from the protagonists' garages in singleplayer. Can be bought from Southern San Andreas Super Autos in Grand Theft Auto Online. This page was last modified on 7 October 2014, at 12:33.